Surety Construction Company successfully completed this 7000 sf interior/exterior renovation on time and on budget. The Man Cave Project came out of the need of a local business power couple to have a place to store their personal wine and car collection incorporating a space to watch sports, and entertain friends and family. This empty shell “storage” facility has been transformed into a beautiful, elegant area – perfect for entertaining. The wine cooler has an impact glass enclosure, with a mixture of epoxy and cork floors and houses 22,000 bottles of wine valued at over 1 million dollars. The eyes are drawn to the six gorgeous exotic cars sitting on 2 ½’x5’ stone tile from Italy. The entertaining area was designed with fun, sports and comfort in mind with a full restaurant kitchen, 2 handicap restrooms, 2 guest bathrooms, a full bar with a Quarts top, cherry cabinets, stainless steel appliances, beer tap, and a gas fireplace with a black granite landing. Clear coated 1×3 maple slats where installed on the ceilings for decoration and interest, and on the walls to hide access doors. Technology within the Man Cave is completely integrated and intuitive. The entire system is controlled with Savant Control Automation Technology which integrates the security, cameras, HVAC, audio/video, shades & lighting control. The security system includes 5 partition access control with 22 interior and exterior cameras. 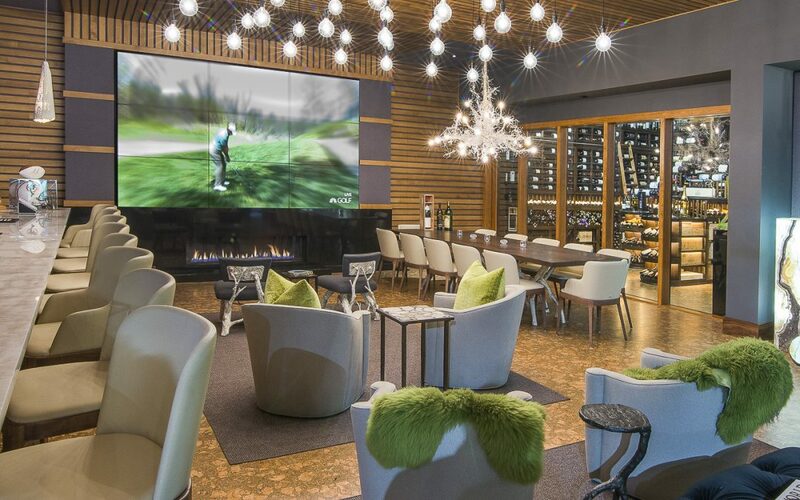 The video wall is the centerpiece of the Lounge, with nine 55” 4K LCD video monitors creating a full 165” viewing screen or two other optional viewing displays. Behind the bar are two 55” Seura mirror TVs, invisible when not on. The exterior improvements consist of moving and adding impact windows, adding 2 – 12’ powder coated garage roll down doors, new entry storefront doors, fresh paint, new landscaping, and a 40kw generator that powers the wine cooler and 30% of the rest of the building during a power outage. This project truly is a site to behold.